In a recent research report leading telecoms vendor Ericsson in collaboration with consultancy firm Ernst & Young ask the question; What Makes a Successful Telco Business strategy? The study released last week clearly outlines the strategies “frontrunners” are taking in the telco space. The study found that front-runners, those ISP’s who have rapidly growing market share in their respective regions were most likely to be ranked around third by market position. The study shows that over the course of four years between 2010-2014, these front runners were outperforming their competitors by a margin of 6.9% compound annual growth rate (CAGR). That’s pretty significant! With mobile data use on the rise, as well as traditional revenues coming under pressure, what were the types of strategies being used to produce such outstanding results? 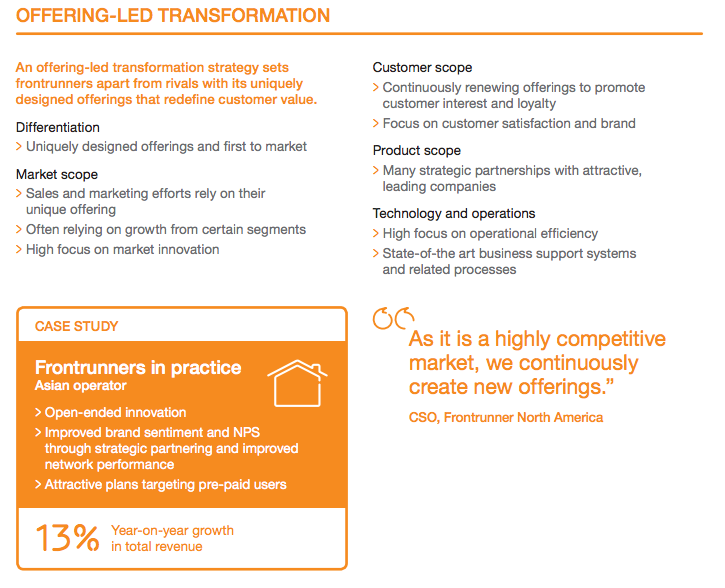 Offering-led transformation: Which refers to operators that differentiate by being first to market with uniquely designed offerings. 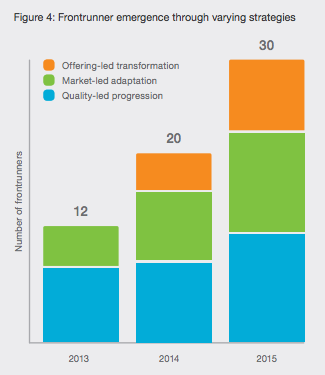 Quality-led progression: Where operators differentiate through high-performing networks and high brand preference. Market-led adaptation: Includes those operators that differentiate through quick adaptation to market conditions. During the period of the research, there has been a significant shift in the strategic approach frontrunners are taking. In 2012, the majority of telco’s were leveraging their size and assets to deliver superior quality and thereby achieve profitable growth. With time, we have seen that operators applying other types of strategies are also emerging as frontrunners, indicating that profitable growth can be achieved more effectively by offering consumers additional value. Frontrunners are outpacing the market by using value-added services that differentiate them from the rest of the market. There is also a strong focus on garnering new revenue streams instead of trying to maximise old ones by voice and by challenging industry conventions to make connectivity more relevant to people, business and society. Bypass is a Value Added Service provider for ISP’s; we provide products for ISP’s that lead to offering led transformation. We have seen our key customers win awards and grow much faster than the market average. BNSL develops white-label products for ISP’s. We have been in successful in offering Global Mode & Buddy Guard as a point of differentiation for ISP’s which allow them to be first to market with a unique product set. Our operational model has further accelerated demand as, unlike traditional capital-intensive commercial models our products are payable monthly, based on usage. By shifting a traditional technology cost centre into a marketing profit centre, we deliver valued added products that create value in the mind of the customer. We’ve seen our ISP’s grow exponentially. Get in touch if you’d like to know more about how we can improve your APRU and profitability using an Offering-led transformation strategy. The full report can be found here!